Provides options for default behavior when clicking the Red X to close the main d7 window. 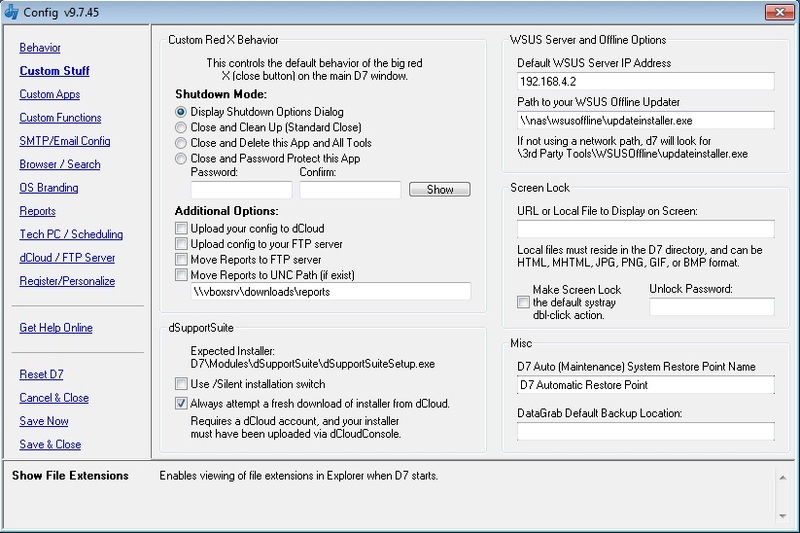 By default, the Shutdown Options dialog is shown, allowing you to manually select shutdown options and apply them. These options are for users of dSupportSuite only and can be ignored otherwise. Default WSUS Server IP Address – This option configures the IP address of your WSUS server, if you have one. This information is used when using the Windows Updates via WSUS options in the Internet menu and on the Tweaks tab. d7 expects the default IPv4 notation here. Path to WSUS Offline Update Client – Used for the WSUS Offline option in the Internet menu. A feature to quickly lock the PC from usage, available in the d7/Main menu or via the tray icon. Useful for working on multiple PCs in public areas where you have to leave a PC unattended during the course of your work. URL or Local File to Display on Screen – A file or URL to display while the screen is locked. A URL must start with http. A file can be HTML, MHTML, JPEG, PNG, GIF, or BMP format and must reside in the d7 directory. Unlock Password – Used to unlock the screen. Make Screen Lock the Default Systray Double-Click Action – does what it says. d7 Restore Point Name – simply the name of the system restore point that is created when using that option in d7. DataGrab default backup location – simply put, the default location for backup listed in the DataGrab window.